Clusters of 1 1/2" wide, light lavender double to single flowers sit atop the sturdy stems beginning in late spring with flowering continuing through much of summer on established plants. Mac's Double Purple Spiderwort is a unique double flowered selection of this durable and reliable native perennial. 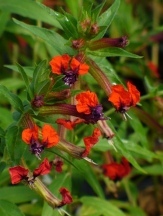 The perfect addition to any cottage garden, low maintenance landscapes, and in containers. Easy and carefree. Spiderwort is a clump forming perennial that produces a mass of narrow, strap-like foliage topped by flowers ranging in color from deep royal purples, through blues, pinks, white, and with variegated flower forms as well. 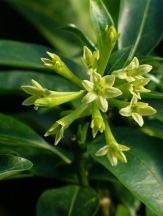 Flowering begins in earnest in spring and continues well into summer. The flowers are visited by a variety of pollinators including bees and butterflies. Cutting the entire plant back to near the ground after flowering is completed in summer mayhelppromote fall flowering. Most of the Tradescantia's that we enjoy in the garden today as perennials are hybrid selections of our native species often found growing in consistently moist soils at the edges of woodlands, ditches, and near bogs. These hardy and long-lived perennials require little additional care and maintenance once well-established and are resistant to browsing by deer and rabbits. Spiderworts flower best where they get at least part or most of a day of direct sunlight and regular water but are tolerant of a wide range of soil types from wet clay to average moisture in sandy loam soils as well as lightly shaded conditions. In hot summer climates or under drier growing conditions midday or afternoon shade is preferred. This is the average expected mature height by width in feet or inches. Feet are represented by a single quote and inches by a double quote. Under poor growing conditions plants may be slightly to significantly smaller, whereas excellent growing conditions can produce larger more vigorous plants. USDA Cold Hardiness Zones were established to give gardeners, horticulturists, farmers, nurseries, and landscape architects a universal way to describe where a plant will survive with regard to average winter lows for a region. And these are averages, here in zone 8B ('A' represents the colder half of a zone and 'B' represents the warmer half of the zone and they are separated by about 5oF) we have seen single digits but that is the exception but should be noted by the daring gardener. Each zone is separated by 10oF and the map was updated in 2012. Our zones do not always agree but we try to use our own experience as to what can be depended on to return or have known reputable gardens and or horticulturists to reliably grow that plant in zones that are usually colder but sometimes warmer than what other resources have available. For more on stretching your cold hardiness zones see the "Do you know the many benefits of an organic mulch" below. If you do not know your zone you can find it using the link below. Full Sun - 8 hours or more of direct sunlight; Partial Sun or Partial Shade - 4-6 hours of direct sunlight; AM Sun or Morning Sun or Cool Sunlight - cool sunlight but usually in the shade during the heat of the day; Light Shade - Bright indirect sunlight for much of the day; Filtered Shade - may receive some amount of direct moving sunlight like through trees but usually not for any extended period especially during the heat of the day; Shade - no or very little direct sunlight, especially not during the heat of the day. Acidic or Strongly Acidic - pH less than 5.5; Mildly Acidic - pH 5.6-6.5; Neutral - pH 6.6-7.3; Mildly Alkaline - pH 7.4-8.4; Alkaline or Strongly Alkaline pH higher than 8.4. Acid loving plants that are grown under alkaline conditions often exhibit nutrient deficiencies since the roots are not able to draw some types of minerals from the soil. Gardenias, for instance, may need to be sprayed with chelated iron. Most plants that are native to alkaline soils can be grown in neutral to mildly acidic soils successfully, although the opposite generally is not true. Soil & Moisture: Moist to average moist, well-draining, moderately fertile to poor soils. These are the basic soil types and moisture levels where this plant will survive, not necessarily thrive. Drought resistant plants will need to be well-established, usually 2-3 years at a minimum, in the garden or landscape before they are able to withstand lengthy periods (weeks or months) without supplemental water. Most plants will grow and flower and or fruit best where they have ample moisture and nutrients available during the growing season. With that said, many plants, like prairie natives, are quite adaptable to soil types and can thrive in heavy clay as easily as a loose sandy loam. Do you know the many benefits of a proper organic mulch? Click here to learn more. Help to improve soil organic matter as it breaks down. Provide shade for the soil to help reduce moisture loss and prevent weed seed germination. Provide soil microbes, mycorrhizae (beneficial fungi), earthworms,and even nematode predators the necessary organic matter and ecosystem to thrive while their actions aid in improving soil tilth and or friability (think of this as the ease with which roots are able to penetrate the soil). Provide insulation to protect the crowns of tender perennials and die-back perennials giving gardeners up to an extra half a zone of winter warmth allowing us to grow that which we normally could not. Provide soil temperature moderation preventing premature soil warming in winter and providing a cooler root zone in summer. So which mulch is our favorite? Our preferred mulch is Longleaf Pine Straw which has: a natural weed preventative for the first year after it is applied; it is sustainably harvested; and it provides protection from soil erosion and doesn't float away, and yet is still both insulative and breathable; while Longleaf Pine Straw appears to last the longest in the garden and landscape in our opinion as compared to Loblolly. The salt tolerance of plants is a relative description of how tolerant they are to windborne or aerosol and soil borne salt levels. Many plants can tolerate seaside and other coastal habitats or roadsides where deicing has occurred wonderfully while others may die or can simply survive and suffer along. If this does not say specifically that a plant is resistant to windborne or aerosol salts then we simply do not have that data available at this time. Deer Resistance: Not Likely to be Bothered Deer resistance is relative to how hungry the deer (or other herbivores) are, what food is readily available in their natural habitat, and how tasty a particular plant is. Few plants are truly completely 100% resistant to being browsed by hungry deer and other herbivores. Please realize that this is just a guide based on our experience and research but some plants may never ever be bothered. If the plant is a true species and not a hybrid or cultivar this shows where it is normally found naturally. There may be some variation in species that are seed grown, which many of our 'species plants' often are, in order to help maintain genetic diversity. If the plant is a "cultivar" (CULTIvated VARiety) and if the data is available, it shows who developed, discovered it, hybridized it, and introduced it as well as the year it was introduced. 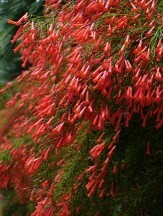 With cultivars you will also typically see the cultivar name in quotes at the end of the botanical or scientific name. The great majority of cultivars are clonally propagated from division, cuttings, and tissue culture so that they remain true to type so have the same desirable traits as the parent such as growth habit, flower, fruit, or foliage form. With forms (form or forma), varieties (var. ), and subforms (subf.) you will see these abbreviations usually between two lower case words at the end of the botanical name. They may be propagated via division or cuttings but can also be grown from seed depending on the plant and what is required to maintain them true to type. Plants that have PPAF(Plant Patent Applied For) or PP followed by a set of numbers it is illegal to propagate the plant for commercial purposes without the implicit permission of the patent holder. Some plants may have the trademark symbol (™) or copyright (©) in the name. These plants cannot be propagated and resold under that name without implicit permission from the copyright or trademark holder. Plants may be both patented and trademarked. The information listed above that has a black arrow symbol, ‣, before the property name is expandable (just click on it anywhere) and will contain additional details and a more in-depth description of the terms that we use in this plant's description. This information is based on our years of experience both gardening and growing plants, input from other horticulturists, nursery people, gardeners, and research. If you feel we are missing important information about a plant please feel free to share it with us so that we can pass it on.